When I was a teenager, I was certain that given enough time, pressure, and heat, I would eventually grow up to be just like my mom. And sure enough, like virtually every daughter born to every mother, everywhere--I am on occasion startled to hear her voice coming out of my mouth. But as it turns out, I needn't have worried. I am instead horrified to realize--as I sit at the computer in my underwear at 1:30 in the afternoon--that I grew up to be my dad. Like him, I've discovered that the world looks better when viewed on the horizontal, and that getting dressed is what one does for company. Alas, this is not news that's going to thrill my mother. I've complained before that the more free time I have, the less I manage to actually accomplish. If I were a savvy marketer of my own shortcomings, I would defend this by saying that I work better under deadline. In actuality, I'm slovenly and mostly just want to read and eat and watch the occasional LOST episode. When I do suffer a bout of energy, I do all three at the same time and call it work. For the last few days, everything took a backseat to grading, which had to be completed by noon on Tuesday (see? deadline). But now that that's finished, I have a few weeks during which any incentive at all to get dressed is going to be hard to come by. Unless the fire alarm goes off, I may not open the front door until June 1. Which would be really bad news for you. There's just not that much material in my cat. Related (because I've been headed down this road a long time): Friday night lights (out). 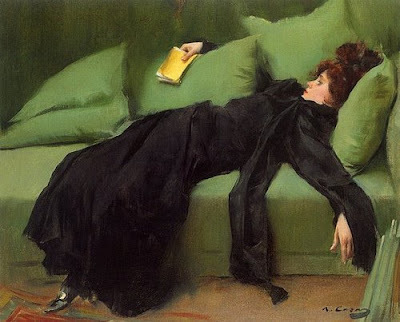 image, Ramon Casas i Carbó, 1899, Jove Decadent. Is that what we're ALL doing? I thought it was just me.